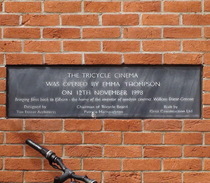 The Tricycle Cinema was opened by Emma Thompson on 12th November 1998. Bringing films back to Kilburn - the home of the inventor of modern cinema: William Friese-Greene. Brought to our attention by Ed Fordham's blog, which suggests that Friese-Greene's studios were on this site. Inside the foyer of the Tricycle Theatre/Cinema is a plaque that reads: "The Foresters Hall was first opened in 1929. It became the permanent home of the Tricycle Theatre Company, founded by Ken Chubb and Shirley Barrie in 1980, through the support of Brent Borough Council, Greater London Council and the Arts Council of Great Britain. In May 1987 the building was almost entirely destroyed by a fire, which spread from a neighbouring timber-yard. An extensive re-building programme was funded by ..... 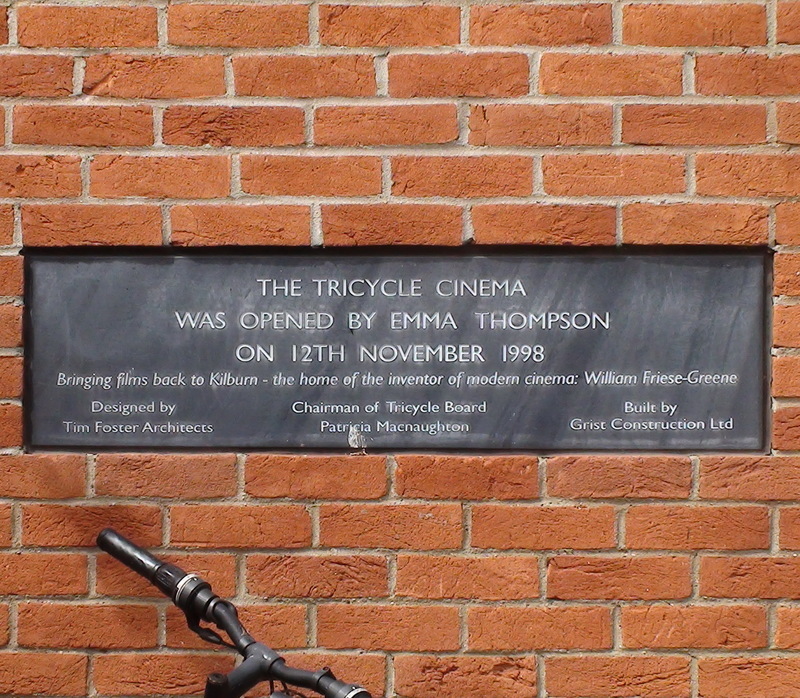 The Tricycle Theatre .... re-opened on 14th September 1989." The Ed Fordham blog has a photograph of a building "just down the Kilburn High Road, a few yards from the Tricycle ... a row of late victorian buildings that has some stone tracery - in the form of film rolls!" It really is a very unusual architectural feature but we could not find it. If you are nearby please look out for it - and tell us how to find it!